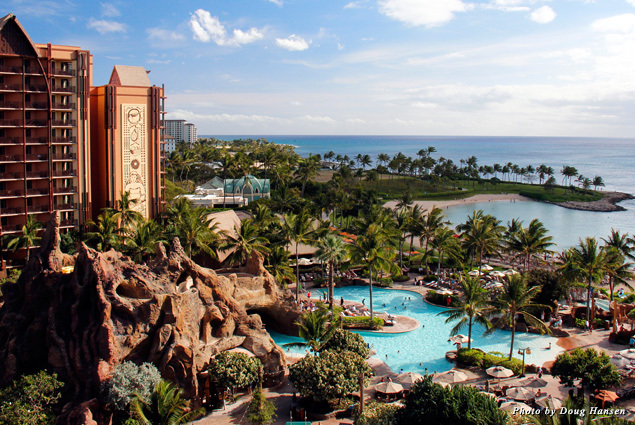 For a family vacation in Hawaii, it’s hard to imagine a place more accommodating than Aulani, a Disney Resort & Spa on Oahu. 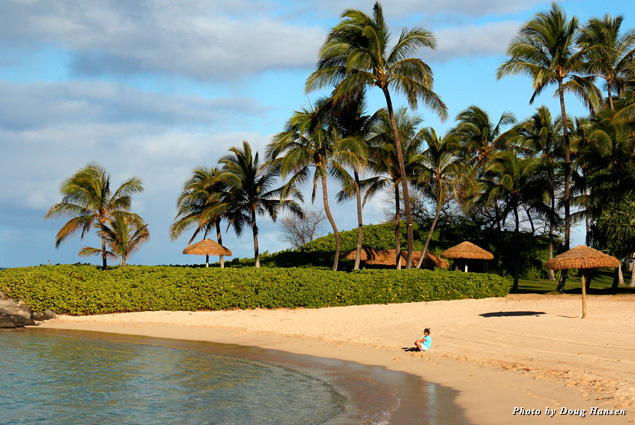 Located 17 miles west of the Honolulu airport, this relatively new (opened in 2011) luxury resort sits on a beach far removed from the hustle-bustle of Honolulu. During the five days my wife and I spent at Aulani, we marveled at Disney’s masterful portrayal of traditional Hawaiian culture. 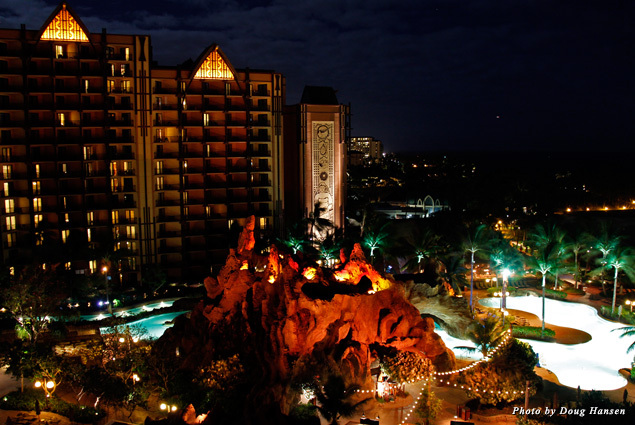 It’s a place where adults and kids can enjoy themselves without ever having to leave the resort. 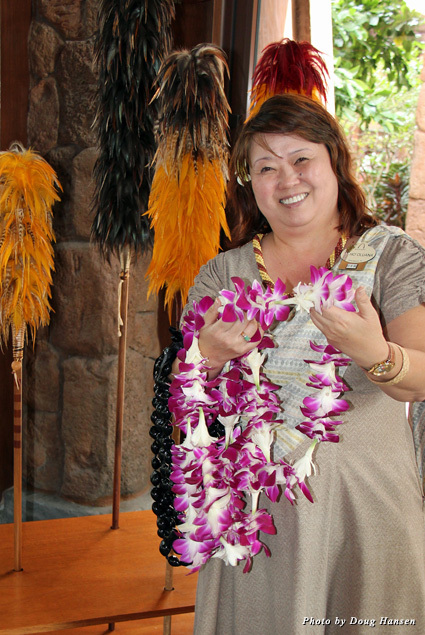 When we first arrived at the imposing resort, we were struck by the profusion of traditional Hawaiian artifacts in the lobby and throughout the grounds. 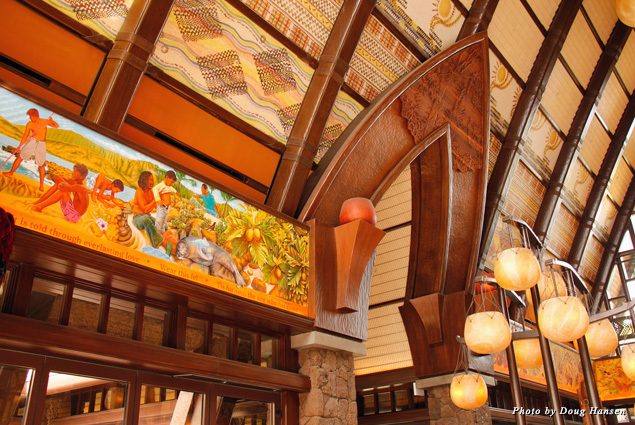 As a staff member explained, “The goal of Aulani is to convey the stories of Hawaiian traditions and culture.” According to the Disney folks, Aulani has one of the world’s largest collections of contemporary Hawaiian art. I particularly liked the painted mural around the entry that depicted Hawaii’s history from the first Polynesians until more recent times. We made our way to one of the two large towers to find our one-bedroom villa, which delighted us with its tasteful décor, full kitchen, and best of all, a panoramic view of the seven-acre pool area below and the shimmering ocean in the distance. Surprisingly, we found the traditional Disneyland characters were quite understated—in fact we mainly encountered Minnie Mouse and Pluto in the morning at the indoor/outdoor Makahiki buffet, where Minnie sang and Pluto enticed kids and parents to join a lively conga line that weaved around the tables. The kids’ delight added a nice touch to the ambiance as we savored our freshly made omelets and assorted fruit while watching the koi swim in the pond next to us. 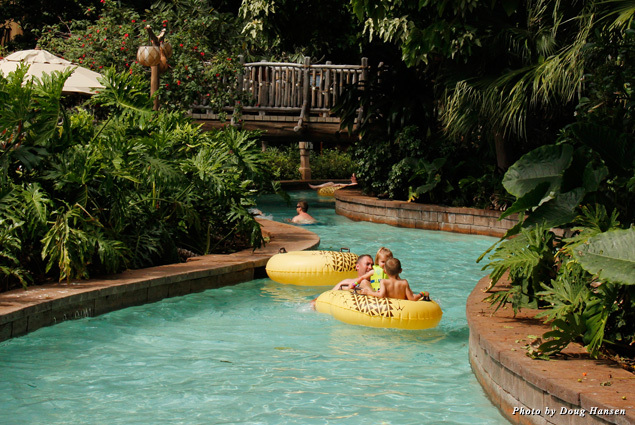 Throughout the day, the air was filled with the joyous sounds of children laughing and shouting as they cavorted on the water-drenched jungle gym or hurtled down one of the volcano’s slides. I thought about what George Bernard Shaw once said: “We don’t stop playing because we grow old; we grow old because we stop playing.” Throwing caution to the wind, my wife and I summoned our child-mojo and yelled like kids as we descended the volcano on a giant yellow inner tube, speeding down the slick, curving slide. After splashdown, we floated along the meandering “river” through the gardens until finally disembarking at one of the large swimming pools. My wife headed off to swim in the lagoon, so I chose to join other adults in the hot infinity pool. I found many parents taking advantage of Auntie’s Beach House, the superb, free child-care facility nearby. Why wouldn’t they? 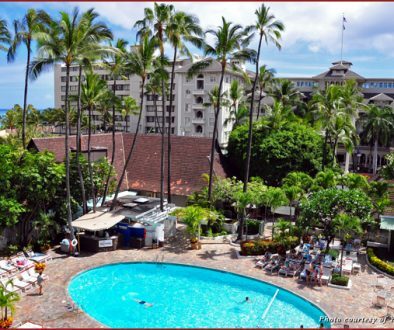 It offered a state-of-the-art collection of Hawaiian-themed games, crafts, computers, movies, and an extensive outdoor playground over which any child would go crazy. (Note to nervous parents: Each child wears a computer-chipped bracelet, which shows their location at all times.) While mostly catering to children ages 3 to 12, Auntie’s and the resort in general accommodated teenagers, too, by offering teens-only evenings and teen-specific spa treatments. When we weren’t floating the hours away in the indolent river, my wife and I hung out at the resort’s private lagoon. A line of boulders blocked the waves from entering, which made morning swims a pleasure. Later in the day, we alternated between stand-up paddle boarding, kayaking, snorkeling, and swimming in the shallow turquoise water, which contained more fish than I had expected. The real fish extravaganza, however, was tucked away in the middle of the pool and garden area. Rainbow Reef, with its 1,300 colorful fish representing 49 species, provided a totally safe and gratifying alternative to open ocean snorkeling—perfect for beginners. 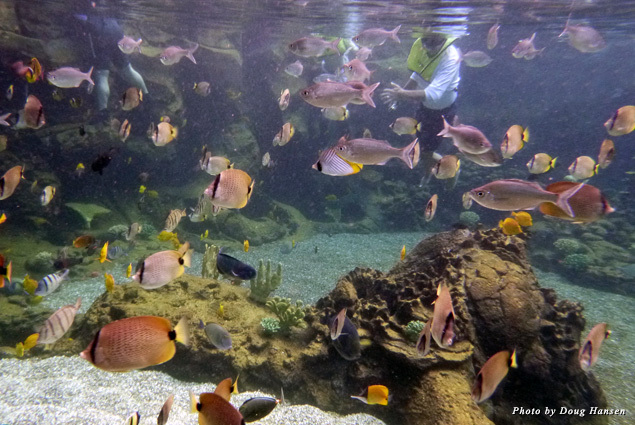 We marveled at the diversity of colors and shapes of the fish as we floated around the enclosure. Afterward, we stood by the reef’s large, below-water window to watch one of the twice-daily feedings. Early mornings were our favorite time to get out and walk for a couple of miles on the ocean-hugging path. Joggers puffed past us, couples strolled along sipping their coffee, and the palm trees swayed in the morning breeze while the azure lagoons calmly awaited the next batch of beachgoers. 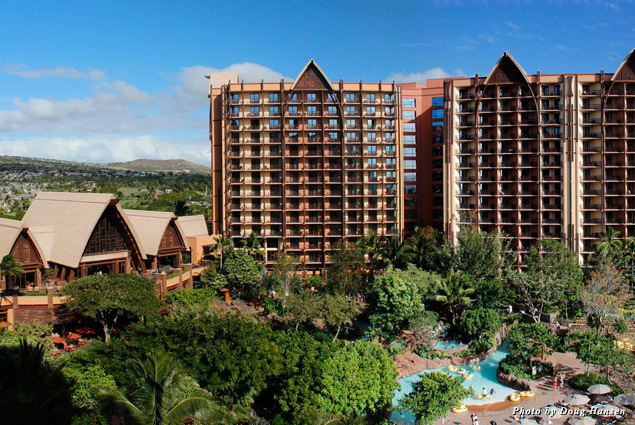 We thoroughly enjoyed this Hawaiian version of Disney’s “Magic Kingdom,” particularly because of the resort’s extraordinary adherence to culturally accurate Hawaiian motifs throughout the resort. 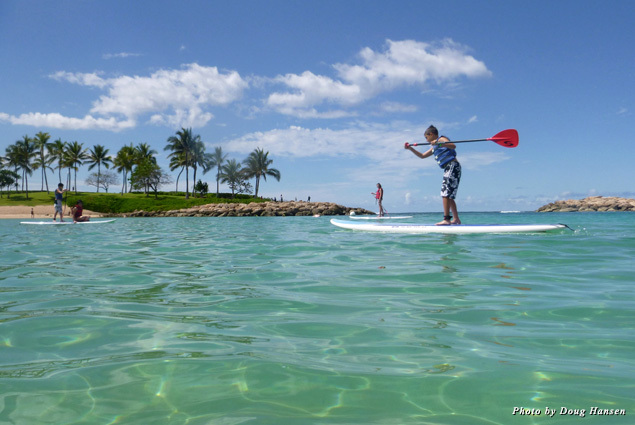 As our guide pointed out, “Everything, including activities, integrates Hawaiian culture. For example, the outdoor yoga by the lagoon reflects our Hawaiian ideal of ‘harmony with nature.’ Even the round glass balls on the garden area’s lights represent the kukui nuts that our ancestors used to burn in torches.” Kids of all ages used hotel-provided GPS devices to search for Menehune—the Hawaiian version of leprechauns—hidden throughout the grounds. 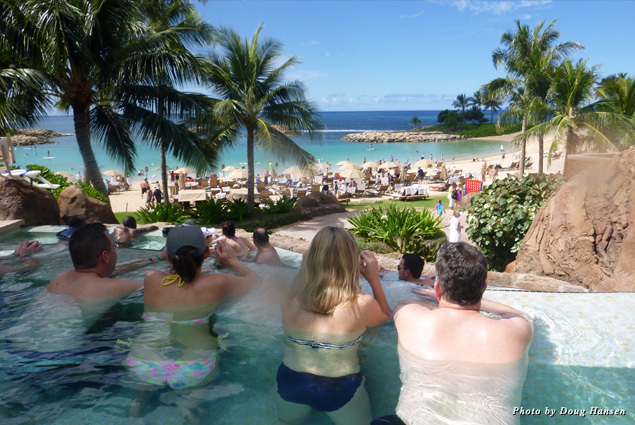 Don’t miss the regular guided cultural tours provided by the hotel; the more you learn about traditional Hawaiian culture, the more you will appreciate and enjoy your stay at Aulani. On our last night, I stood on our balcony gazing at the serene beauty of the garden below, and I knew that the small, bright lights embedded in the bottom of the tranquil blue pool replicated the shape of the constellation early Polynesian sailors had used to navigate across the ocean for thousands of miles before arriving at this island paradise. Gratitude filled my heart that we were able to share this sacred land and know from time to time we’ll follow that constellation back to Hawaii. Aloha.